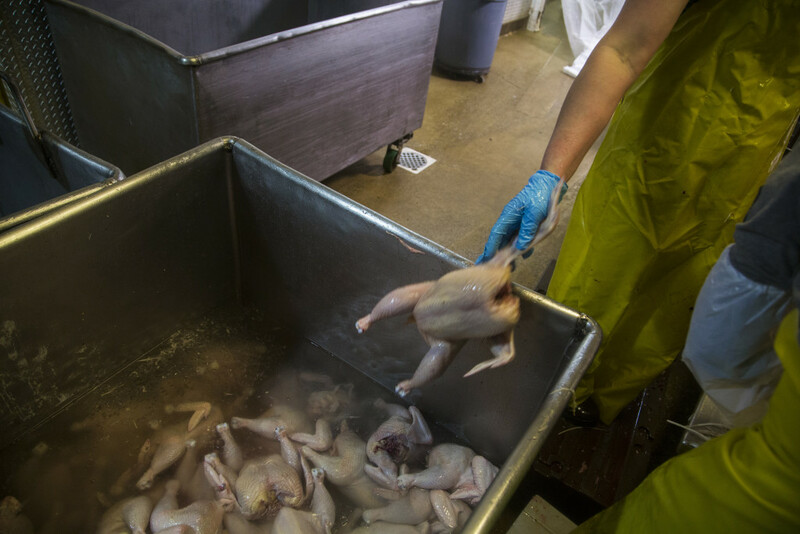 A worker prepares for the weekly harvest of chickens in the kill room at Gunthorp Farms in LaGrange, Ind. In the U.S., regulation of salmonella in chicken meat starts at the slaughterhouse. For our December Reveal radio episode, we’re dedicating an hour to stories about food: We go on a salmonella road trip to take a closer look at the chicken we eat, and we uncover the hazards workers face to make year-round strawberries possible. Subscribe to iTunes here for the podcast or come back to our website when the episode goes live on Saturday. This looks like a humble black work boot with a filthy white sock over it. But it actually is a secret weapon in the fight against salmonella, a microscopic bacteria that can make people sick. It’s one of many things farmers in Denmark have started doing since surging human illnesses prompted the country to no longer tolerate the bacteria in its chicken. It’s pretty simple: Danish farmers wear the socks over their boots when they’re in chicken houses to gather samples of the bacteria in the chickens’ poop. If those socks test positive for salmonella, all the birds in that house are declared contaminated. The house must be thoroughly cleaned out after the chickens are killed. The meat can be offered to customers only if it is cooked before being sold. The United States is far more tolerant of salmonella. 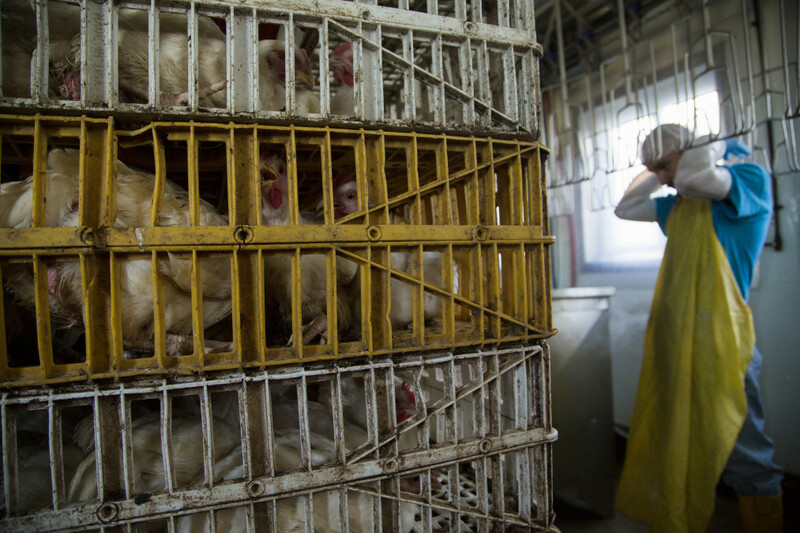 There’s no mandate to control it on the farms or hatcheries that raise chickens for slaughter. Limited testing is required only at the final step: the slaughterhouse. By that time, chickens already can be carrying the bacteria in their guts, its natural habitat. Or it can be on their feathers, feet or skin from their feces. It can spread from carcass to carcass during processing. While processors try to clean the bacteria off the skin and meat with chemicals, some often escapes removal. That means that if you want to eat chicken in the U.S., salmonella is a risk you have to live with. It’s one that’s getting more prominent, too. Americans are eating more chicken than ever as they move away from red meat. Antibiotic-resistant strains of the bacteria can make it harder to combat. And it can be fatal. After a 2013 outbreak linked to Foster Farms in California, Reveal and a number of other media organizations – including The New Yorker, The Oregonian and FRONTLINE – have uncovered holes in our food safety system that allow people to get sick from our most popular meat. Here’s a list of what you should know before you eat your next chicken dinner. It’s legal to sell raw chicken that has bacteria on it that could kill you. In the U.S., it’s simply accepted that salmonella may be on the raw chicken we buy in the grocery store. In fact, about 25 percent of raw chicken pieces like breasts and legs are contaminated with the stuff, according to federal data. Not all strains of salmonella make people sick. Cooking the raw meat can kill the bacteria that is dangerous, but you still can get sick if you don’t handle it exactly right. There’s a chance of contaminating the cutting board, the knife, the kitchen counter and the sink. Here’s official guidance on how to deal with your chicken before it is your dinner. If you do get sick, it can be a lot worse than a few days with an upset stomach. Salmonella can cause diarrhea so bad that it can lead to hospitalization. When illness is severe, infection can spread from the intestines into the bloodstream and to other places in the body. The illness can be truly gruesome. Without treatment with antibiotics, people can die. Rick Schiller’s infected leg swelled to twice its normal size, thanks to salmonella from Foster Farms chicken. His purple limb was filled with a “chunky, meatlike substance” that a doctor drained with a syringe. Noah Craten, an 18-month-old, had a persistent fever for nearly a month. Doctors eventually found abscesses on his brain, which they linked to a salmonella infection in his bloodstream. Salmonella is the rare foodborne pathogen that is both common and potentially deadly. Many of the deadliest pathogens, such as E. coli and listeria, are comparatively rare; many of the most widespread, such as norovirus, are mercifully mild. Salmonella is both common and potentially lethal. Salmonella sickens about 1 million Americans a year, and about 380 of them die, according to the CDC. No other foodborne pathogen causes more hospitalizations or deaths than salmonella. About 200,000 of those illnesses come from poultry every year. Chicken is a common source for salmonella infection in people. Even when processing plants meet federal standards, they can be the source of massive outbreaks. When the Foster Farms outbreak occurred, the processing plants in question were easily meeting the federal salmonella standard, which allows 7.5 percent of whole chickens tested to be contaminated. But that standard applies only to whole carcasses – not the cut-up pieces, such as breasts, wings and thighs that most shoppers buy. When birds are cut up, salmonella may be released from the skin. And birds can contaminate each other while they’re being cut up and when the pieces are mixed together. That helps explain why a processing plant could be meeting current federal regulations but still making lots of people sick. The standard also does not distinguish between strains of salmonella that are harmless to humans and those that are the most dangerous. Currently, the government has standards for whole carcasses and ground chicken, not individual parts sold at supermarkets. New rules are in the works that would change this, but they likely won’t be finalized until early next year. Plus, the proposed standard would represent only an improvement over the current level of contamination of chicken parts – about 25 percent – by still allowing 15.4 percent of them to carry the bacteria. There’s no requirement to test chickens for salmonella where it spreads – on the farm. The only regulation of salmonella in our chicken meat occurs at the slaughterhouse. But healthy birds can acquire and spread the bacteria to each other long before that. Most strains don’t make them sick; the chickens are just carriers. “We have such a convoluted food safety system in the United States,” said Greg Gunthorp, who has a very small processing plant on his farm in Indiana where he slaughters chickens. He describes an imaginary line around his processing plant. 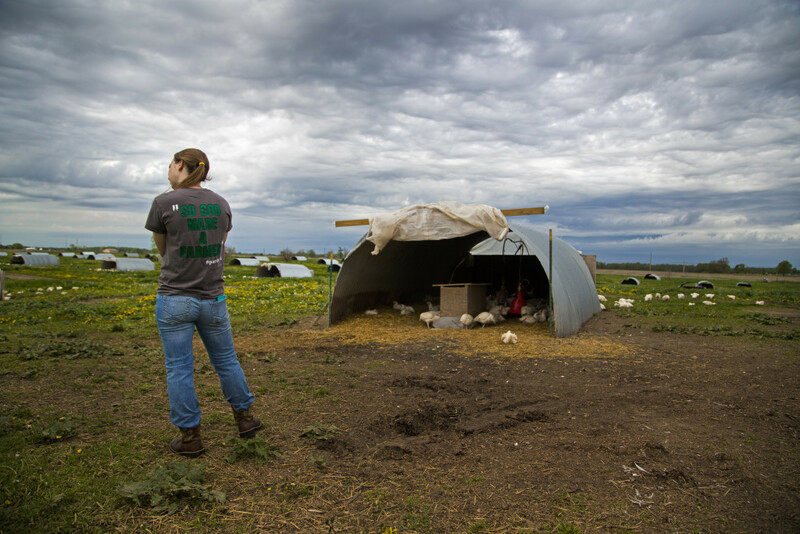 Inside it, the U.S. Department of Agriculture’s Food Safety and Inspection Service has “ultimate jurisdiction,” but out on the pasture where the birds grow, “they couldn’t come out here if they wanted to,” he said. Chickens can get salmonella from the breeding flocks that produce them. The chicks can pick it up at hatcheries, grow houses or pastures on farms where they fatten up. Any measures that producers take to control salmonella in those places are entirely voluntary. USDA food safety inspectors have no authority to try to force breeders, hatcheries or growers to reduce or eliminate salmonella, no matter what the strain, even if it has been linked to an outbreak of human illness. By failing to control salmonella at the source, even back to the breeding flocks, the bacteria is allowed to spread throughout the whole life cycle of the chicken. In the slaughterhouse, the bacteria gets on to the meat. Processors try to blast it off with chemicals to meet the federal standard, but that allows some meat to head out to consumers contaminated with salmonella. 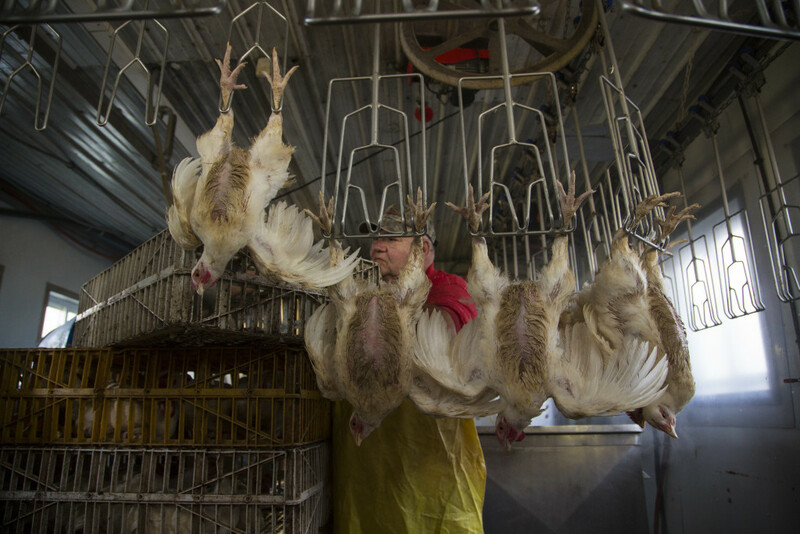 Processing plants aren’t shut down when they’re cranking out contaminated birds. In the midst of the Foster Farms outbreak, one of the plants in question was shut down – not for salmonella, but for cockroaches. After many months of reported illnesses, Foster Farms eventually did recall some chicken at the government’s request. But that recall was voluntary. The USDA cannot shut down poultry processing plants even when they have violated its salmonella standard year after year. That’s because the government doesn’t classify salmonella as what’s known as an adulterant. It is instead treated as a normal part of chicken that’s a potential hazard but can be destroyed by proper cooking. The USDA tried to shut down a beef processing plant that was consistently failing its salmonella tests in the late ’90s. But a 2001 court ruling found that the government couldn’t do so because the bacteria wasn’t an adulterant. Once something is considered an adulterant, it cannot be sold as food for human consumption unless it has been inactivated by cooking or some other process. Efforts to reform the system have been opposed by the industry and failed. So why not decree salmonella an adulterant? The USDA did so with E. coli O157:H7 in ground beef after a 1993 outbreak at Jack in the Box restaurants killed four children and sickened hundreds of other people. But testifying at a congressional hearing last year, Agriculture Secretary Tom Vilsack said his agency does not have the authority to declare salmonella an adulterant, even for antibiotic-resistant strains like those implicated in the Foster Farms outbreak. Members of Congress, such as Rep. Rosa DeLauro, D-Conn., have disputed that interpretation of the law. DeLauro told Vilsack at the hearing that the agency should ask Congress for more authority if it lacks it. Today, she says there’s been no such request from the USDA. DeLauro argues that the USDA doesn’t want to take on the food industry on this issue because the agency has too many conflicting priorities. If the agency were to declare any strains of salmonella an adulterant, it almost certainly would face a legal challenge from the industry. But it’s worth noting that the USDA tangled in court with the beef industry over E. coli O157:H7 in ground beef and won. Consumer advocates and members of Congress have strongly advocated for at least some dangerous strains of salmonella to be labeled. The Center for Science in the Public Interest, a nonprofit advocacy organization, petitioned the USDA to declare four strains of antibiotic-resistant salmonella an adulterant, which would mean recalling meat and poultry when the pathogen is detected instead of waiting for human illness to strike. Earlier this year, DeLauro and Rep. Louise Slaughter, D-N.Y., introduced legislation that would require the USDA to recall meat and poultry contaminated with pathogens that are resistant to two or more antibiotics considered important for human medicine. But so far, neither of those efforts has gained traction. Industry lobbyists have fought attempts to crack down on salmonella. They say the price of chicken would go up and farmers would suffer if salmonella were labeled as an adulterant. “If salmonella did become an adulterant, it has the possibility of wiping out about a third of the chicken supply in the U.S.,” said Ashley Peterson, senior vice president for science and technology for the National Chicken Council. Avoiding industrial chicken by buying local isn’t any safer. Smaller isn’t better when it comes to controlling salmonella at chicken processing plants, a Reveal analysis of more than nine years of USDA data shows. Samples taken from very small processing plants had higher rates of salmonella than those from small or large ones, records show. Samples from the largest plants had the lowest rates of contamination. For some smaller plants, there’s a trade-off between controlling salmonella and other values. Some purposefully avoid washing the carcasses with harsh chemicals such as chlorine after they’ve been processed. Being chlorine-free can be a selling point for some customers. Europe banned such chlorine treatment in the ’90s out of fear that it could cause cancer, NPR reported. Kadejan, a very small processing plant in Glenwood, Minnesota, processes about 7,000 birds a week without chlorine. Since 2008, Kadejan has shown up on the official list of plants failing to meet the USDA salmonella standard over and over again. Raising backyard chickens won’t protect you, either. You don’t have to eat your chicken to get salmonella from it. As backyard chickens have become more popular, salmonella outbreaks from live poultry have risen, too. When DeAnna and Dan Gabriele’s 14-year-old son ended up in the hospital in 2013 with chest pain and a 103-degree fever, his parents say doctors suspected cancer. Fluid had built up around his heart and lungs. But the cause was salmonellosis – an infection from salmonella. It took the lacrosse and football player months to recover. The source of the infection: chicks from Mt. Healthy Hatcheries in Ohio. The Gabrieles had backyard chickens. The Gabrieles’ son didn’t have to get sick. Although the family had no idea, the hatchery had been fighting a serious salmonella problem linked to hundreds of illnesses and two deaths in the previous two years. But salmonella isn’t regulated in hatcheries. So the Ohio hatchery went on selling chicks carrying the bacteria. The year the Gabrieles’ son got sick, the hatchery was linked to 158 reported illnesses. The year after that, the problem continued, with 363 people known to have gotten sick in 43 states. The CDC offers this advice on protecting yourself from illness if you have backyard poultry. Pro tip: Wash your hands – a lot. Antibiotic-resistant strains of salmonella are on the rise. Salmonella is an old problem, but it has gotten worse as antibiotic-resistant strains of the bacteria have developed. The strains of salmonella Heidelberg involved in the Foster Farms outbreak were resistant to several commonly prescribed antibiotics, according to the CDC. The good news was that those antibiotics were not ones typically used to treat salmonella blood infections or other severe infections from the bacteria. Still, the agency noted that being infected with antibiotic-resistant bacteria can lead to increased risk of hospitalization. 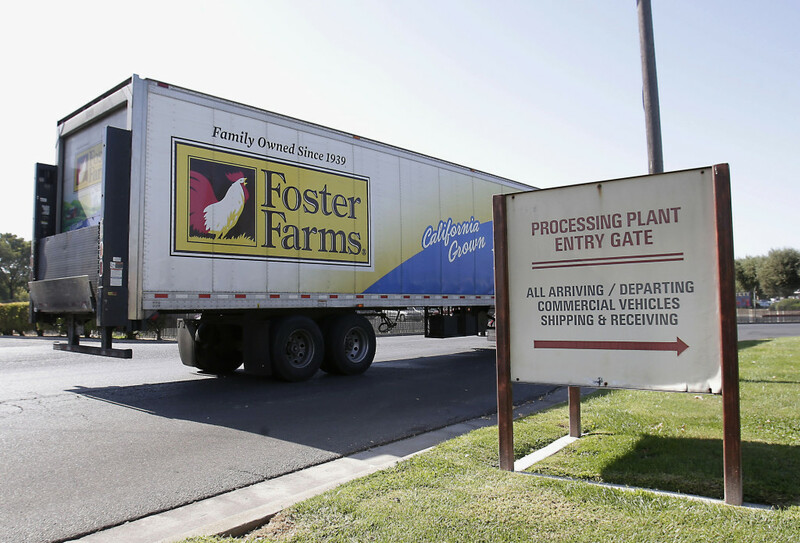 Nearly 40 percent of the patients known to have been sickened by the Foster Farms outbreak ended up in the hospital. Resistance may spread across classes of drugs, rendering whole groups of them less-effective antidotes. It may require the use of more expensive drugs. In the worst-case scenario, it can make severe infections impossible to treat. Other countries don’t stand for salmonella the way we do. Some European countries have taken a different approach to controlling salmonella in poultry – by reining it in long before the birds make it to the slaughterhouse. After a spike in salmonella infections from chickens in the ’80s, Denmark managed to reduce salmonella in its chicken to almost nil. The country now goes years without a single reported illness from salmonella in its chicken meat. The Danes have managed to control it in breeding flocks, going so far as to slaughter infected ones. In grow houses, farmers adhere to strict biosecurity controls, from hand-washing to changing their clothes frequently. They put on a different pair of coveralls and boots before entering each chicken house on the farm, so that if one house is contaminated, the bacteria won’t be spread to the next. And then there are the socks. 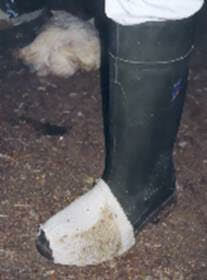 Danish farmers put them over their boots to pick up chicken manure, so each flock’s poop can be tested for salmonella. Birds from Danish flocks that test positive cannot be sold as raw meat in the supermarket. It must be cooked before it reaches consumers as sandwich meat or other ready-to-eat foods. Back here in the U.S., chicken industry lobbyists say it’s not fair to compare our country with Denmark, which is much smaller and produces much less chicken. Also, the chicken meat there is more expensive: as much as almost double the average U.S. price at between $4 and $6 a pound. It’s not just Denmark that’s taken on salmonella. Europe as a whole managed to cut its rate of salmonella infection dramatically in a five-year period, according to the European Food Safety Authority. In the U.S., the rate of salmonella illness has been holding steady at around 15 reported cases per 100,000 people. But for every reported case, the CDC estimates there are 29 that go undiagnosed. This story was edited by Andrew Donohue and copy edited by Sheela Kamath and Nikki Frick. Katharine Mieszkowski can be reached at kmieszkowski@revealnews.org. Follow her on Twitter: @kmieszkowski.